This series of DVDs features state-of-the-art procedures for minimally invasive dental implant surgery in the esthetic zone. The editor has brought together a team of specialists who perform all the procedures and comment on them. The DVDs were recorded on special equipment, didactically edited, and rendered in optimal quality by expert videographers. A compact edition of this compendium is now available, featuring all ten volumes on four DVDs, in a handy slipcase, with an accompanying booklet. 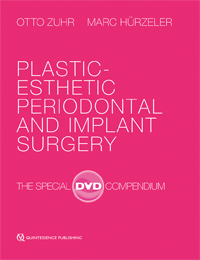 All surgery DVDs were recorded in high-definition DVD quality. FILM 1: Autograft Harvesting | Runtime: 49,32 Min. FILM 2: Gingival Augmentation with Autologous Connective Tissue | Runtime: 29,02 Min. FILM 3: Singular Gingival Recession Coverage | Runtime: 63,28 Min. FILM 4: Multiple Gingival Recession Coverage | Runtime: 47,08 Min. FILM 5: Esthetic Crown Lengthening | Runtime: 37,52 Min. To obtain harmonious gingival contours in the anterior jaw, esthetic crown lengthening may be indicated for natural or restored teeth. If a sufficient height of keratinized tissue is present, this is done by performing an external gingivectomy, either with or without ostectomy depending on the height of the dentogingival complex. If the width of the keratinized gingiva is insufficient, an apical repositioning flap is required. This volume presents the two approaches for esthetic crown lengthening. FILM 6: Horizontal Papilla Augmentation with Autologous Connective Tissue | Runtime: 17,23 Min. FILM 7: Management of Extraction Sockets | Runtime: 77,26 Min. FILM 8: Soft Tissue Augmentation Under Bridge Pontics | Runtime: 62,14 Min. In the context of fixed dental prostheses, for esthetic and hygienic reasons it may be advisable to perform horizontal soft tissue augmentation using connective tissue taken from the lateral palate, or from the tuberosity region. From a clinical perspective, there are two proven techniques: the inlay technique can achieve horizontal augmentation of the alveolar crest and cause thickening of the papillae adjacent to the edentulous space. To cover the graft completely, an additional palatal island flap is recommended. Alternatively, pouch techniques have proven successful where pockets are prepared by undermining and connective tissue grafted into these pockets. A modification of the procedure allows the soft tissue to be concurrently contoured by the pontics of the provisional bridge. This volume presents both techniques. FILM 9: Defect Reconstruction and Concurrent Implant Placement | Runtime: 59,42 Min. Simultaneous implant placement at the time of augmentation is preferable to a twostep procedure, because of the shorter treatment time and greater patient comfort. In the presence of a Class I defect, a reconstruction with particulate autologous or xenogeneic bone substitute and a corresponding barrier (modified double-layer technique) can be achieved. The cortical plate technique is particularly suitable for eliminating vertical aspects of the defect. This volume illustrates both techniques. FILM 10: Implant Placement Using a Modified Roll Flap Technique | Runtime: 16,55 Min.